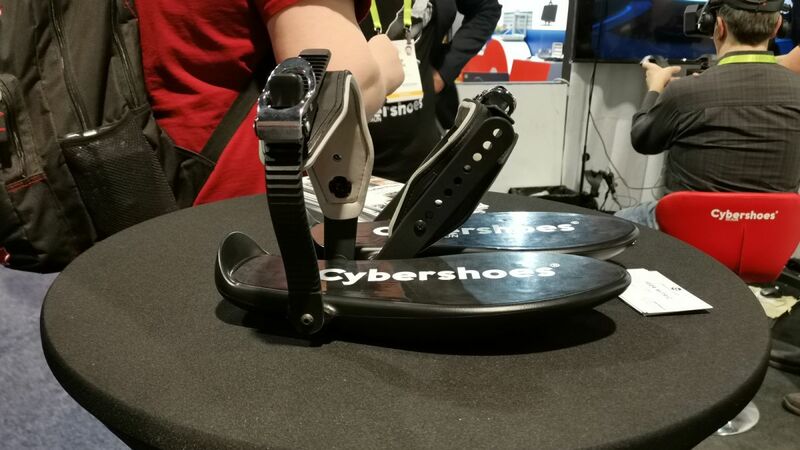 Cybershoes had a wildly successful Kickstarter this fall, so it makes sense that they’d make an appearance at CES 2019. After a short time with the foot peripheral, we can heartily confirm that they do exactly what they say on the tin: let you walk through VR one step at a time. Just don’t be surprised if you get a little winded. VR has had, and continues to have a locomotion problem: move the player too unnaturally, and they might get queasy. Solutions like the Virtuix Omni thought to solve this with a large omnidirectional treadmill rig, which was predictably pricey for a peripheral (around $499 / £297 / AU$528) and took up lots of room. The Cybershoes are an ingenious alternative that look like the love child of a ski boot and a Heelie. Take a seat, strap them on, and slide your feet along the ground (making sure to spin the wheel on each Cybershoe’s bottom) to move in-game. It takes some getting used to, and you’ll feel as if you’re sprinting in place like a Looney Tunes character. You’ll have to spin your feet pretty fast to get anywhere, and it took surprising hustle to get anywhere. Cybershoes set up a pair of demos that showed off different paces of navigating virtual reality: Doom VR for frantic action and Skyrim VR for more leisurely exploration. Both demos took some getting used to, especially in combat: you’ll spin around in your IRL chair to rotate your character and then frantically “run” by rolling your Cybershoes on the floor. It’s a bit disorienting, but not insurmountable. Just make sure not to lose yourself in the game, as I saw another CES attendee get so frantic he almost spun out of his chair. Thankfully, Cybershoes works just like other VR mobility alternatives, so you can just defer to the analog stick or touchpad on your controller if you get tired. One of the Cybershoes staff recommended traditional controls for long treks around Skyrim, then switching to the ‘shoes when I started fighting. The Cybershoes connect over Bluetooth to a small box that plugs into your computer; on it is a dial to calibrate the ‘shoes to your step-length. The peripheral is natively integrated with SteamVR, the company recently told Kickstarter backers, and should work with games that enable mobility functions. The Cybershoes shared the CES floor with its polar conceptual opposite, the 3DRudder, which is a circular pad players tilt with their feet to move in-game. Which one you chose may come down to personal taste. Or, really, platform taste: the 3DRudder debuted at CES 2017 as a PC VR peripheral, but has now been regeared for PSVR. The 3DRudder is a less expensive option, and will retail for $119/€119 (£92, AU$164) when they go on sale in April. Assuming you already have a PS4 console and PSVR, of course. While Cybershoes will likely be sold in a pair (like many of the lower-cost Kickstarter tier choices), the team plans to bundle them in with a particular chair and circular carpet combo for or above $300 (they haven’t finalized the price). Why? The carpet they’ve chosen is non-static, which comes in handy when you’re sliding the Cybershoes up and down around your chair.